Yes, I know. The Internet is filled with lists of Harry Potter holiday gifts. But, not all gift lists are created equal. I wanted to make a list of Harry Potter presents for the adult Potterhead. Every gift on this list is perfect for the grown-up (like me) who still loves Harry Potter but who wouldn't be caught dead with wands, quidditch kits, or cosplay costumes. So, if you or someone you know is obsessed with all things Harry Potter, then this list is for you! Use it for inspiration for the upcoming holiday season or any time of the year. You'll find tons of cute Harry Potter gifts that any Potterhead is sure to love! Why Make Another List of Harry Potter Holiday Gifts? What a good question. As the Harry Potter franchise ages, so do the fans. I, for one, still turn to the HP films and books from time to time as a means of temporary escape from the stress of adulting. Having surrounded myself with fellow Potterheads, I know the power of Harry & the gang when it comes to connecting to youth and imagination. But I've noticed that many of the other lists of Harry Potter holiday gifts focus on cheesy products designed to sell rather than thoughtful presents. So, I decided to make a list of Potter-themed gifts that I'd love to get, even at 37! True Potter fans will never outgrow the magic of Hogwarts, so why not please your Harry Potter fan with a magical gift? This list is full of thoughtful Harry Potter presents for adults to wear, watch, use or decorate their home! Treat your Potterhead special this holiday season with any of these fun gifts! While your Potter fan may not want to wear his or her Potterhead status on a shirt or chain, they may love having thoughtful pieces of Harry Potter home decor around the house! Subtle pieces like these Always Throw Pillows are great for introducing a little whimsy into their every day, making it a perfect gift for a Harry Potter fan. "My Boy, You've Got the Grim!" Professor Sybill Trelawney is fan fav for many reasons! Portrayed by the amazingly talented Emma Thompson, this quirky character plays a pivotal role in the tale of Harry Potter. Her first appearance in the books/films marks a turning point in the series. Things at Hogwarts have taken an even darker turn, beginning with the Grim in Harry's teacup. 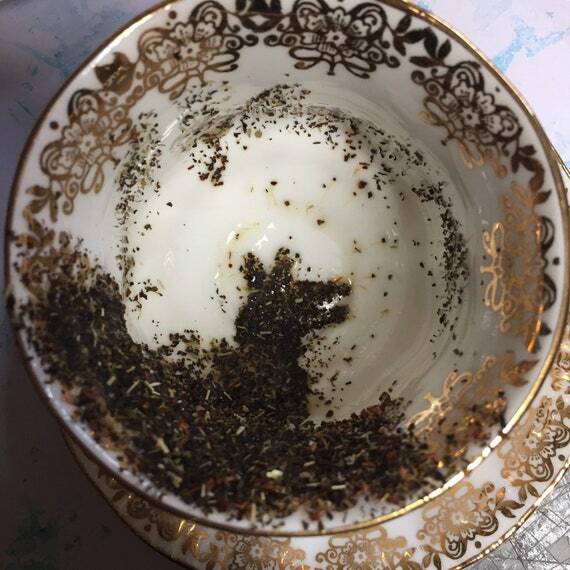 Not only is this Grim Tea Cup Set the perfect gift for divination fans, but it's also an excellent gift for fans of Professor Trelawney or Sirus Black. "where Hogwarts students can purchase necessary supplies"
Any Potter fan knows the importance of places like Diagon Alley and the Leaky Cauldron. After all, some of the most pivotal scenes in Harry Potter occur outside of Hogwarts. Give your Potterhead any one of these fun Harry Potter Signs and watch as they turn their yard, patio, or guest room into Diagon Alley, the Leaky Cauldron, or The Three Broomsticks! "To Miss Hermione Jean Granger, I leave my copy of The Tales of Beedle the Bard"
One of the best parts of the Wizarding World of Harry Potter is the intricacy of the story. Not only did J. K. Rowling do an excellent job interweaving the story and characters in each of her Harry Potter books, but she also managed to incorporate magical history and important works of literature into the storyline. The Tales of Beedle the Bard is a great example. Everyone who's read the final book of the Harry Potter collection knows the importance of the "Tale of the Three Brothers," one of the magical fairy tales in The Tales of Beedle the Bard. Get your Potterhead a copy of the Hogwarts Library by J. K. Rowling, which includes Beedle the Bard, Fantastic Beasts & Where to Find Them, and Quidditch Through the Ages. While many adult Potter fans may find it silly to carry a wand, chances are they would love to decorate their jacket, backpack, or lapel with either of these cute Harry Potter Pins. 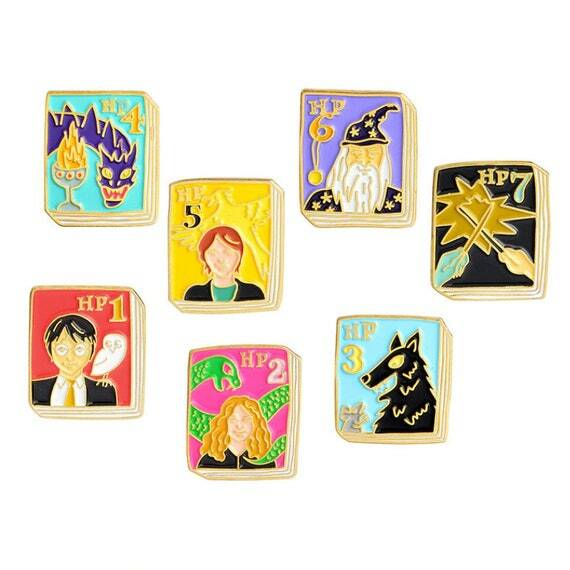 Featuring the seven Harry Potter novels, these enamel pins will add a touch of whimsy to your Potterhead's wardrobe! “You might belong in Gryffindor, Where dwell the brave at heart"
Every Potter fan has chosen their Hogwarts house, but whether you know your Potter fan's house is another story! If you have a Potter fan in your home, chances are they'll love this any of these cool House Pride Gift Sets by Highland Bluff Studio. Your Potterhead can evoke the darkness while filling their home with the warm scent of eucalyptus and mint. If the Dark Arts aren't popular in your home, be sure to check out the other scents and candles in the Highland Bluff Studio Etsy shop! No good wizard or witch should be caught without extra potion! But with this handy Polyjuice Potion Engraved Flask, you can take a little for the road (or the broom). Give your Harry Potter fan this slick black matte flask to carry to his or her next Quidditch game! 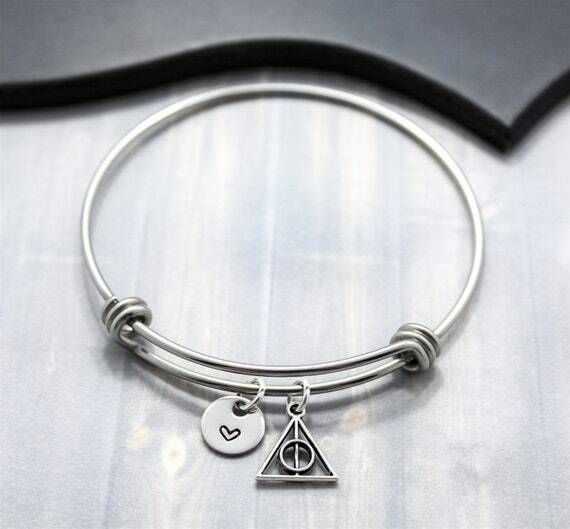 "Together, they Make one master of death"
Over the years many pieces of Harry Potter jewelry has surfaced, but none have been as amazing as this Deathly Hallows bangle. This collection is perfect for any Potter fan who appreciates fine jewelry. "happiness can be found even in the darkest of times, if one only remembers to turn on the light"
Any true Potterhead dreams of visiting Hogsmeade, Diagon Alley, and Hogwarts. But it's only in dreams that we can encounter the world of Harry Potter. Treat your Potterhead to sweet dreams with this lovely Doe Lampshade inspired by the silver doe in the Forest of Dean. Not only is this whimsical lampshade perfect for adult Potterheads, but it's also a great addition to any Harry Potter nursery! "Do You Ever Stop Eating"
If your Potter fan likes spending time in the kitchen, then The Harry Potter Cookbook might be the absolute best Harry Potter holiday gift! Filled with fun recipes inspired by the novels, the unofficial Harry Potter cookbook can help your Potterhead recreate Hogwarts feasts in their very own home! With just a little kitchen magic, you'll soon be eating Treacle Tarts, Pumpkin Pasties, and tons of other appetizers, main dishes, and desserts featured in the pages of J. K. Rowlings World of Harry Potter. "Even muggles like yourself should be celebrating this happy, happy day"
Magic and muggles don't always mix, but, every once in a while, muggles can feel the magic that surrounds them. Celebrate a special event (birthday, first anniversary, Valentine's Day, etc) with a bouquet of Harry Potter Roses! These handmade keepsakes are made from the pages of Harry Potter books destined for the trash bin. Save a tree while giving a gift that never dies! "Considered by many to be the greatest wizard of modern times"
No list of Harry Potter holiday gifts would be complete without the Harry Potter Trivial Pursuit by USAopoly! Not only will your Potterhead love learning all the fun facts about the Wizarding World of Harry Potter, but they'll be all set to host Harry Potter themed parties. And I'm sure there's some way to turn any game of trivial pursuit into a drinking game with a little touch of magic! "There is nothing Dark about the Hallows"
Worn by all the trendiest wizards, the symbol of the Deathly Hallows is the mark of any true Potterhead. Introduced in the final phases of the tale of Harry Potter, the design features all three of the Deathly Hallows: the elder wand, the resurrection stone, and the cloak of invisibility. 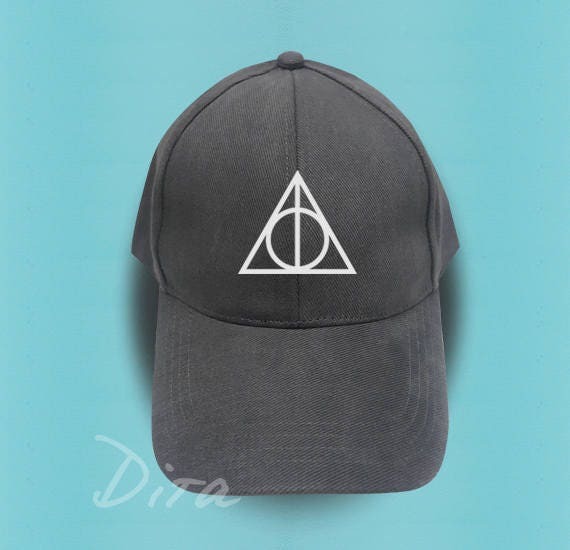 Help your Potter fan show off his Potterdom with something stylish and simple like this Deathly Hallows Hat. "There are more important things — friendship and bravery "
Even Potterheads have bad days. Help your Harry Potter fan remember to turn on their inner light with this cool Gryffindor Morse Code Bracelet. The simple act of feeling the secret code against their skin may be enough to pull wizards from the darkness of doubt and depression. Treat your wizard to a package of Chocolate Frogs from the Wizarding World of Harry Potter or any of the other famous treats from the trolley! Available online and at Warner Brothers Studios! "when in doubt, go to the library"
Help your beloved witch or wizard keep track of all their favorite spells and tales in this gorgeous wooden Harry Potter-Inspired Notebook! Journals make a great gift, so why not encourage your Potterhead to jot down their thoughts and feelings in a Harry Potter-themed journal! For those of us who remember waiting for the next book or film to be released, the lack of new Harry Potter material can be a bit disheartening. All good things must come to an end, but not all good things must die! Help your Potterhead relive Harry's finest moments with this special Harry Potter Wizards Collection DVDs by Warner Bros! Filled with behind the scenes footage, these multi-regional DVDs tops the list of perfect Harry Potter holiday gifts! While travel by broomstick may not be possible, flight is still a reality for some Potterheads. For the traveling Harry Potter fan, you might want to consider this Muggle Passport Cover & Luggage Tag. Both features a Harry Potter inspired quote and is a great way to encourage your traveler to keep exploring. 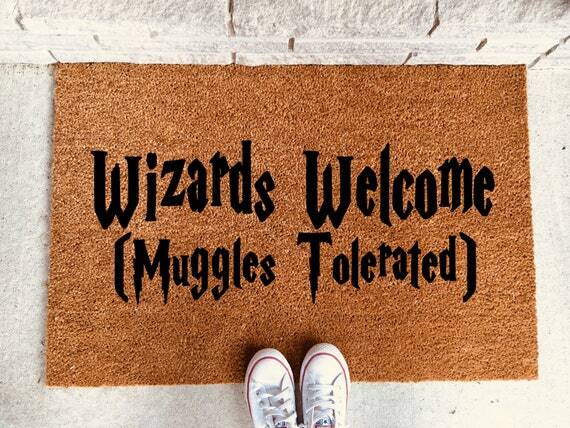 Every wizard needs to feel welcome somewhere, so why not help make your Potterhead's home more welcoming with this Wizards Welcome Mat. It makes a great housewarming gift for any Harry Potter fan! "I Solemnly Swear I'm Up to No Good"
Visiting Hogwarts may now be a reality with the Wizarding World of Harry Potter theme parks, but experiencing the World of Harry Potter is still out of reach for some. Now you can bring the magical world of Hogwarts to your Potter fan this interactive Maurader's Map! Trust me, they'll know which charm to recite to turn on this magical map. "Purveyors of Aids to Magical Mischief-Makers"
The Marauder's Map this is not, but this Messrs T-Shirt may be the next best thing! 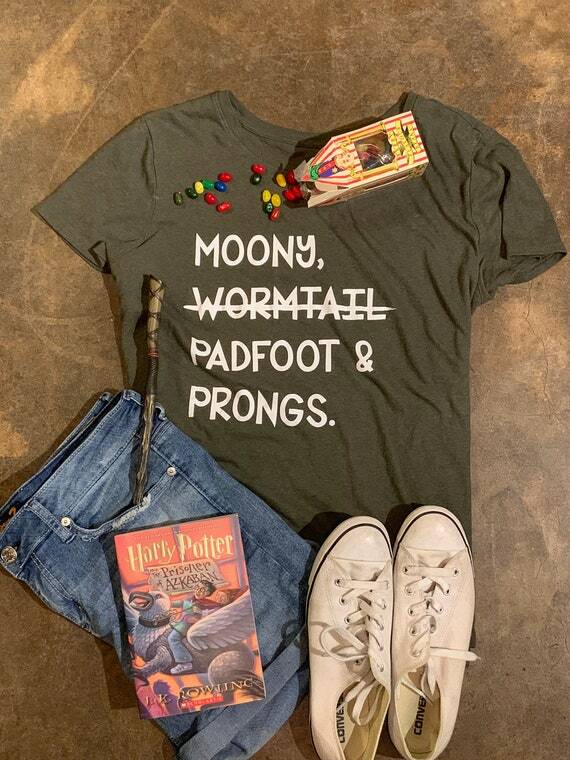 The manly Potter fan in your life will love the simple text design of this t-shirt. Now he can sport his Potterdom without looking silly! How many times has your Potterhead wished for a wand to find lost things? Probably a ton. Help them remember their keys with this fun Harry Potter themed Accio Keychain by Anes & Eve. Hopefully, they'll be able to find their keys without the need for a wand! "Why on Earth Should That Mean It Is Not Real?" Most true Potterheads will argue that the movies fail to capture the magic of the books. Help your Potter fan keep the magic alive with this gorgeous Complete Harry Potter Collection by J. K. Rowling! If all else fails, this set should top your list of Harry Potter holiday gifts! As we age, Harry Potter fans look to more mature ways to show their love for Hogwarts and all things Harry Potter. 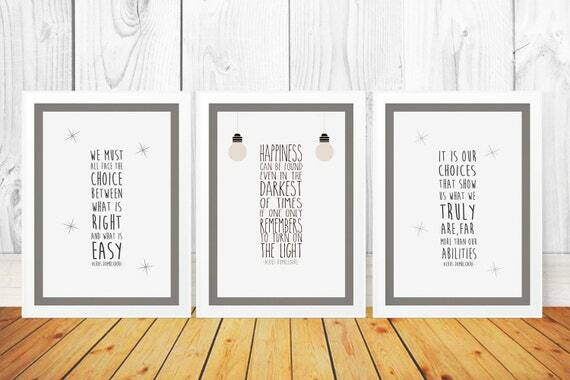 This elegant collection of Harry Potter Prints would be the perfect addition to the home of any true Potterhead. The understated design and classic look make this print a great choice for a holiday or housewarming gift! 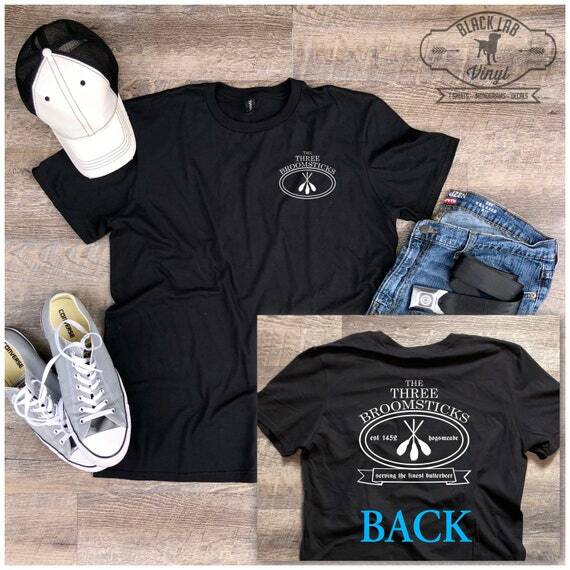 "Why don't we go and have a butterbeer in the Three Broomsticks"
Send your Harry Potter fan back to Hogsmeade in this cute Three Broomsticks T-Shirt. He'll get tons of compliments and maybe even meet another wizard or witch while sporting this tee. After all, what's life without a little fun every now and again!? "The mind is a complex and many-layered thing." Every Potterhead knows how frustrating it is to lose your place in your favorite J.K. Rowling novel. Never let your Potter fan forget his/her place with this fun Harry Potter Bookmark! This laser cut metal bookmark is designed to stand out and to stand the test of time. "I shall never reveal the best of you"
Chances are, your lady Potterhead shed a tear or two when reading of Snape's never-ending love. And, I'll bet she gasped a bit when the doe Patronus found Harry in the forest, guiding him to Ron and the sword of Gryffindor. 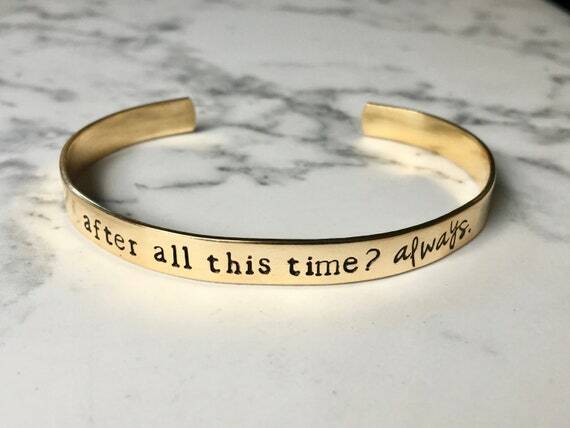 Snape's secret probably still sends shivers down her spine, and so will this Always Stamped Bracelet. Just wait and see! “Words are, in my not-so-Humble opinion, our most inexhaustible source of magic"
Even wizards like to send and receive greeting cards, so why not treat your Harry Potter fan to this set of Dumbledore Quote Cards by Simple Serene. The life lessons contained make them perfect for Potterhead parents on graduation day. "Quidditch! Is that all boys care about?" Who doesn't appreciate good Quidditch humor? 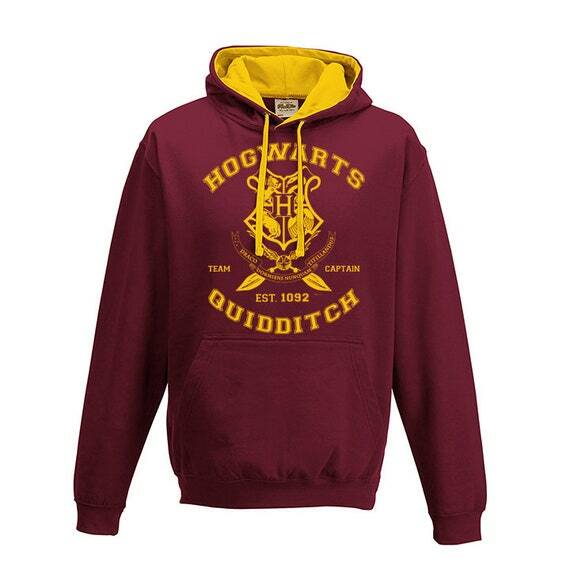 Give them something to wear to the next game with a Team Gryffindor Hoodie. Show off their house pride in style. “What are you doing with all those books anyway?" Every Potterhead could use some help organizing their books. 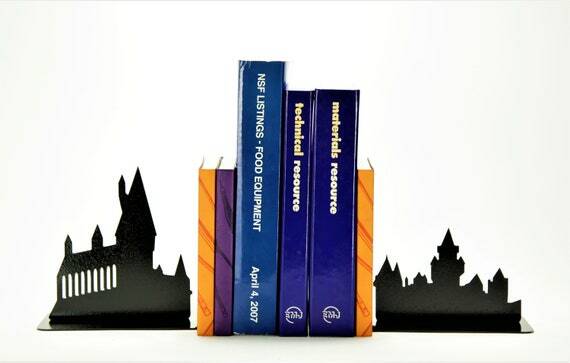 Give the Potter fan on your holiday gift list a set of Hogwarts Bookends and watch the magic happen! These metal bookends are perfect for a birthday gift, housewarming gift, or graduation gift, too! "We are pleased to inform you that you have been accepted"
If you're witch or wizard has a thing for sending mail, then this gorgeous Hogwarts Seal Gift Set is the perfect Harry Potter gift! With this lovely wax seal set, your Potterhead will be sending official Hogwarts correspondence in no time!